95 - 99 DODGE / EAGLE / MITSUBISHI. 2.0L (1997cc) DOHC L4 16V, "420A" NON-TURBO. Brand New Timing Belt Kit & Water Pump Set. 95 - 99 CHRYSLER SEBRING 2.0L DOHC L4 16V, ENG. 95 - 99 DODGE AVENGER 2.0L DOHC L4 16V, ENG. 95 - 99 DODGE NEON 2.0L DOHC L4 16V, ENG. 95 - 98 EAGLE TALON NON-TURBO 2.0L DOHC L4 16V, ENG. 95 - 99 MITSUBISHI ECLIPSE NON-TURBO 2.0L DOHC L4 16V, ENG. 95 - 99 PLYMOUTH NEON 2.0L DOHC L4 16V, ENG. 1 Timing Belt (150 teeth). 1 Water Pump & Seal. 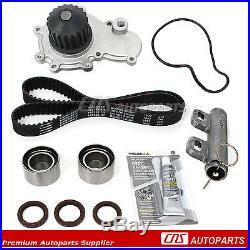 The item "Timing Belt Water Pump & Hydraulic Tensioner Kit 95-99 Chrysler Dodge 2.0L 420A" is in sale since Thursday, July 14, 2016. This item is in the category "eBay Motors\Parts & Accessories\Car & Truck Parts\Engines & Components\Timing Components". The seller is "cnsautoparts" and is located in South El Monte, California. This item can be shipped worldwide.